RIOTING AND LOOTING gripped the north London town of Tottenham last night, after a protest over the shooting dead of a local man by police took a violent turn. Police cars, a bus and several shops were set on fire on Saturday night when crowds took to the streets to demand “justice” for the death of Mark Duggan, 29, a father of four, who was shot dead by police last Thursday, the Guardian reports. The protest began as a peaceful demonstration outside Tottenham police station, with members of the community demanding answers in relation to Duggan’s death. One demonstrator told the Telegraph: “The police have not had the courtesy to come to the family, the decency or respect to tell them what is going on. And that is what we want: answers, justice. And we are going to be here everyday until we get answers”. However, as night fell proceedings took a violent twist, with vehicles being set on fire and buildings being smashed and looted. Eight police officers were hospitalised following clashes, the BBC reports. London Fire Brigade said crews had managed to get the fires under control “for the moment”. Warning: the slideshow below includes images which some viewers may find disturbing. 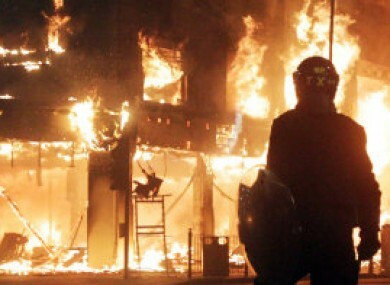 Email “Riots in London as protest turns violent ”. Feedback on “Riots in London as protest turns violent ”.